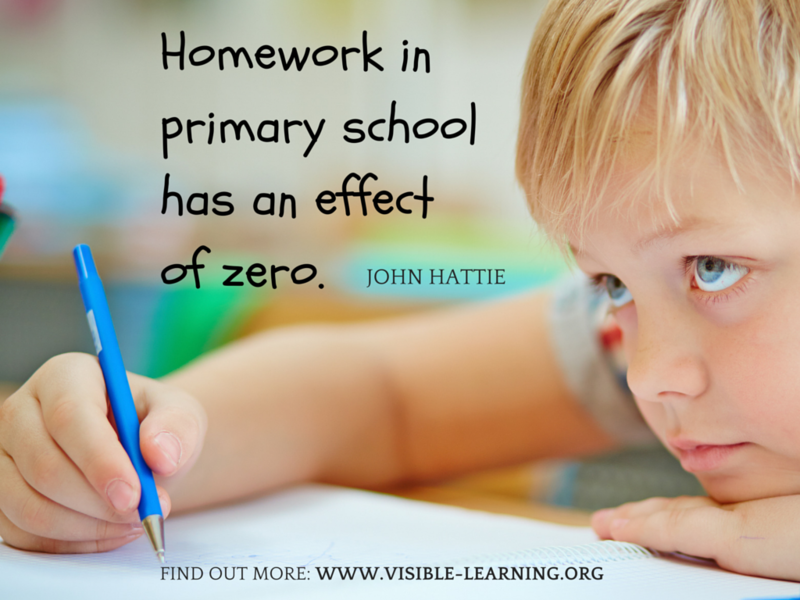 “Homework in primary school has an effect of around zero”, says Professor John Hattie. But what does really work in education, schools and classrooms around the world? Every week Sarah Montague interviews the people whose ideas are challenging the future of education, like Sugata Mitra, Sir Ken Robinson and the headmaster of Eton College Tony Little. In August John Hattie, Professor of Education at the University of Melbourne, was her guest at BBC Radio 4. You can listen to the whole interview with John Hattie following this link (28 mins). Here are some quick takeaways. If you want to read further about what works best in education you can order the books Visible Learning and Visible Learning for Teachers. Listen to the whole interview with John Hattie at BBC Radio 4. If you want to read further you can order the books Visible Learning and Visible Learning for Teachers. BBC Radio 4: The Educators. I beg to differ, depends on what type ! E.g. Cook a meal with mum or day, explain today’s Math to a family member, read the last chapter of a book, make a touch cast report of your pet, use time laps photography with your iPad to show the growth of a seed into a plant, find Mars using an iPad app, create a billboard online that promotes one of the current issues …. And I quote: So, don’t get rid of it. Treat the zero as saying, “It’s probably not making much of a difference but let’s improve it”. I agree. What can we do to give it a greater effect? “Flipped” classrooms for example have a great effect on student learning as modern research shows. Spot on.I work in Dubai and that’s how we plan homework. No rote but just enriching linkage to lessons learnt. Our kids enjoy these and are eager to share their experiences and learn tremendously from each other! ! All well and good if the parents can afford an iPad………. Spot on John. Also, maybe let them chose from several options an activity which is of interest to them. I use to be an advocate for streaming but I was wrong… kids learn best when there are varied abilities in the room. Class sizes don’t matter… quality instruction … minimal instruction .. maximum participation for students… and yes homework is over rated. Based on what research? Im not saying you’re wrong, just curious what facts you’re using to support your opinion. very simple data and anecdotal evidence. Empirical research from over 800 meta-analysis — hardly “simple data” nor “anecdotal”. Evidence-based. It’s John Hattie, are you a dinosaur? What current educational research sites don’t draw on his ongoing research? These comments are reflecting what research the Sutton trust has accumulated. It shows that homework and class size make no difference and the thing that makes the most difference is noticing children’s responses and adjusting immediately according to them. In my head, this is obviously easier to do well with a smaller class. So if you want good teaching and not burn teachers out trying to individually respond to 32 children in each lesson, then reducing class size will make a difference. But class size in itself doesn’t. I also think that we have a large number of children who need nurturing not just teaching facts. So again a smaller class is beneficial to this end. It’s all about the quality of what is happening in the learning environment not the number students. A good teacher will have a good impact with 14 or 40 kids. You have to change what you do to meet the needs of the students. I believe class size does make a difference. It certainly did with my daughter. Not from a teaching perspective, but from a learning perspective. The more students in a classroom, the more distractions and behavioral issues there are. My daughter is not a child who is easily distracted, but two years ago, she left public school and switched to online learning with a small amount of students in her class. She said there is a huge difference in the number of times the teacher has to stop the lesson in order to reprimand a student. The problem with Hattie’s research is that it is not primary school based but rather based across all schools from preschool to tertiary. Smaller classes make a huge difference especially in the junior school and it is covert teacher bashing to say that the teachers don’t change with smaller classes. They can and they do. They can’t with larger classes no matter how skilled they are. It’s the same with home work. If the homework is being encouraged to work with mum or dad in the kitchen or the garden por encouraging parents to read and act out stories with their children these will make massive differences to achievement. I agree completely. Last year I was lucky enough to have a class of 18 for the best part of the year. I do believe the spring in my step made me a better teacher. A number of my D students became B’s. I believe in a normal class grouping I would have been lucky to get them to a C. I don’t think Prof. Hattie can measure my stress levels. There was so much joy in teaching my little group of children! Jules you are so right! With the complexities of children’s personal lives having a smaller class enables us to have time to address their individual needs both personally and academically. We can then feel happier in our ability to fulfill each child’s needs which gives another avenue to help reduce our stress levels. Not a fan of homework, except as a little revision, especially in primary school. My 5 children attended a state primary school, which had multi-age classrooms, which assisted children to learn at their own pace. It worked. It was also a Glasser school, which helped with socialisation. My eldest child is 27, and has Asperger’s Syndrome. The other 4 have all been accepted at tertiary institutions. All but one of those 4 were educated completely at state schools, with 1 attending a private school for her last 3 years of school, at her own request, for social (not academic) reasons. Perhaps children, especially boys, should begin school at a later age. Having read and used Professor Hattie’s research in order to make positive impacts on student learning and outcomes, and having listened to many interviews, I can honestly say I have never felt that he covertly bashes teachers with his findings. The opposite in fact. I have always found Professor Hattie to speak positively of teachers. As a teacher, I wish more people in the public arena would validate what we do. hang on. I remember like it was yesterday that when I was put down a group I immediately sank down to the equivalent level in that group. Ie in footballing terms, relegation zone in premiership led to relegation zone in championship. And how come nobody mentions the threat of being beaten up (let’s call it bullied) for doing well in the “second set” group? That was also a very real threat. You certainly didnt want to shine once you were relegated. Why does nobody mention this? Presumably this is a neutral site? I agree as a parent i believe homework makes a difference….provided parent/s are involved. 1. I know what my child is learning in school. 2. I can pick up what my child needs extra attention to work on, help her with it and bring this to the teacher’s attention. 3. Show an interest in what my child is doing during her day. Only helps build on a stronger family unit. Why is it, that never is there a word about student behaviour and the huge effect it has on learning, not just for the behaviour problem students, but for all children within that classroom! Unacceptable behaviour can keep a classroom in an upheaval . Also, the undesirable effects of hard drugs while in the womb…also alcohol! Then we have undernourishment and exhausted children. And we must not forget the trauma many are experiencing…separated parents, bickering parents, living in households where adults are smoking inside, eating a diet of processed foods, a parent or parents drinking to extremes on a daily basis, sexual abuse, seeing a parent being abused… and I could go on! All of these things and more are what many children are experiencing on a daily basis. Change will take place in the classroom and learning will take place when things change first in our homes and in our lives. It is the parents responsibility and we need to hand it back to them! Couldn’t agree more with Elizabeth’s comments – but when you have an inspired and passionate teacher who can see beyond the behaviour and identify the effects of trauma in a youngster – the impact on that child, that class can be huge! Critical skills training can be invaluable – visible learning at worst can lead to children becoming statistics in the forensic analysis of data when actually they will gain more and teachers will have more of an impact with 5 minutes of care and concern and perhaps being the only person that has spent 5 minutes 1:1 with that child! Real relational trust takes time and genuine concern and interest in children developing and progressing – what is an assessment capable learner? Sounds like a robot! Behavior is a big learning factor for the student with behaviors and those around them. Our son has a diagnoses with multiple co-morbids ADHD/Anxiety/OCD/Depresson/PTSD/Sensory disorder. The depression and PTSD was brought on in his therapist’s opinion by using peers to assist in helping other students, which doesn’t always have a positive impact and bullying at school. It got to the point where he was taking 3 stimulants, a mood stabilizer and an anxiety med just to make it through the school day. And then he’d come home and have so much homework he never got to go outside to run off his excessive energy and then 3 more pills to bring him down so he could sleep. Not to mention the ill side effects of weight gain (he’s a 7th grader now 5’5 and weighs 200 pounds thats horrifying). We pulled him out of mainstream school last year, weaned him off all meds and home school now. His self confidence is building, the weight is slowly coming off and he’ll be done early with the program we bought mainly because he can fly thru what interests him and he already has a wealth of information on and he can spend more time working on new information. We APPLY his lessons to his every day life. All that being said maybe less pressure should be put on the child having homework and more time spent on educating parents about what their child is being taught and how to apply it to their every day life. As a daycare provider I know that not all parents will back a teacher up but I do think that they’d be surprised how many parents would. Very interesting thoughts. To say it has zero effect seems a bit far fetched for all students. It depends on the quality of the school and quality of life at home. I work with low income students who seem to not have much education at home. The homework the teachers send helps us evaluate where the children are and help increase their education even if the parents are not involved in their education. Children with strong support systems probably benefit by helping around the house more and being a great part of the community. Yes I agree with Hattie when he says, “a lot of students gain a tremendous amount of their learning from their other students in the class.” Empirical evidence in my class has shown for those who are “not into” a particular subject, their influence (teaching) on others to fall behind, not engage in activities and not do the work is infectious. Make it more interesting people say, how interesting can you make a football game for those wanting to do ballet? Put them on the field and they will learn though, they will learn to avoid playing against the Alphas at all costs so the best solution, get into trouble to avoid having to integrate, cause trouble so the lessons gets dragged out. All of these theories I’m sure work, but it needs a tag line: They work “in the ideal world.” The fact is that we don’t live in one. I’m not sure what you mean by integrate? Please forgive me if I’m wrong. I take your comment to say that if a child doesn’t itegrate into the classroom setting, they’ll fail at adulthood? We have two older children with ADHD and they never truly integrated into the school system but outside school in their ongoing education and career’s they’ve chose career’s in fast paced, every changing fields one medical, one education and they’re excelling. Failure to integrate into a classroom setting does not automatically set a child up for failure in their adult life. It’s parents who drive the homework. They think it’ll make their kids smarter. Teachers are under pressure to give kids extra work. A lot of teachers would rather not give homework. Reading with an adult is the best thing you can do for your child. Homework that reinforces the application of skills and knowlegde already taught will prove to be purposeful. The time spent on homework must be in keeping with the concentration span of the child. It should not be an extension of the school day. 6 to 9 year olds learn best through play. Written tasks rob them of that opportunity to explore whilst developing valuable life skills. When we know better, our moral obligation is to do better. Saying, “Yeah, I see this research. It just doesn’t fit with what I believe” is a profession of non-professionalism. Hattie is a fraud. Unfortunately, many seem to have been taken in by his profoundly flawed research and his political motives. 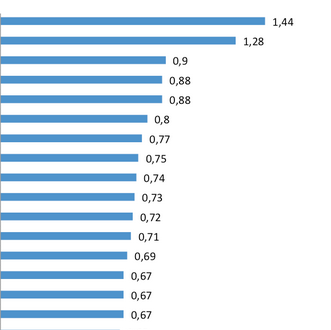 11 other websites write about for "John Hattie on BBC Radio 4: “Homework in primary school has an effect of zero”"